A range of incredibly delicious organic Scottish seaweed infused rapeseed oils, bringing seaweed to everyone, and in a way they'll love. Founded by Doctor Seaweed aka Dr Craig Rose, a marine biologist and wild-seaweed harvester whose vision is to see everyone able to enjoy and benefit from seaweed. 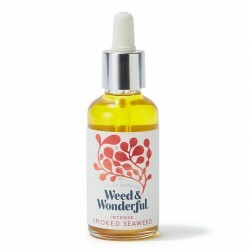 Weed & Wonderful's unique seaweed infused culinary oils are convenient to use and have superb flavours, making it easy to fall in love with seaweed and benefit from its many qualities for food, health and nutrition. And, they are more than just a brand. They are the producers of seaweed, sourced in the pristine Scottish Outer Hebrides, where it is sustainably wild harvested using unique proprietary techniques. Doctor Seaweed's Weed & Wonderful was winner of Branding Project of the Year 2018, and Chefs' Choice Award Finalists 2019.